Built in the Balearic Islands’ second-largest—though considerably lesser-known island behind Mallorca and party haven Ibiza—Minorca is a 271-square-mile island surrounded by see-through blue-green water and arid cliffs. On the southern tip of Minorca you will find Sasga Yachts, a builder who has been selling family-size cruising yachts into Europe since 1978. 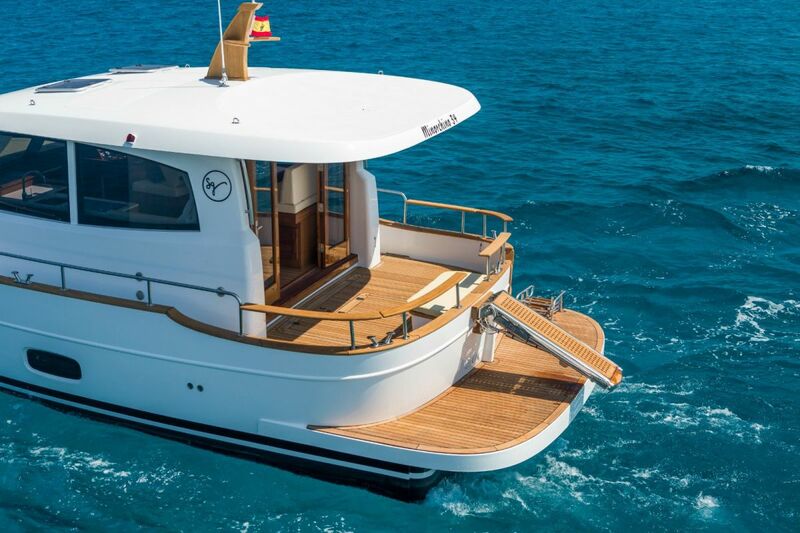 Now, thanks to owner Jose Luís Sastre and a new partnership with Sarasota Yacht Sales (SYS) in Florida, the line of fiberglass boats is coming to the United States under the Minorca Yachts badge. 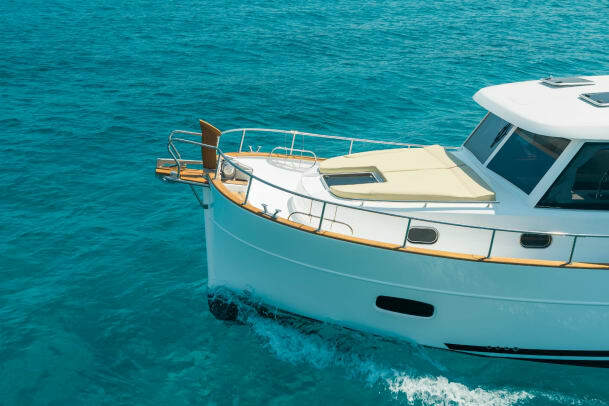 Production boats in the Minorca line (called Minorchino if you happen to cross paths with one in Europe) start at 34 feet, which also happens to be the first model introduced to the States at this year’s Miami International Boat Show. 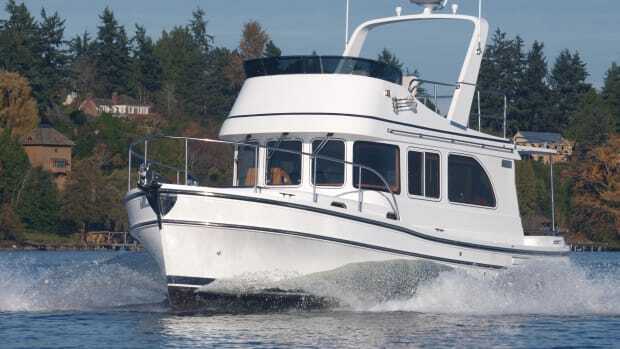 Moving up, there are 42- and 54-footers, offered in either sedan or flybridge versions. 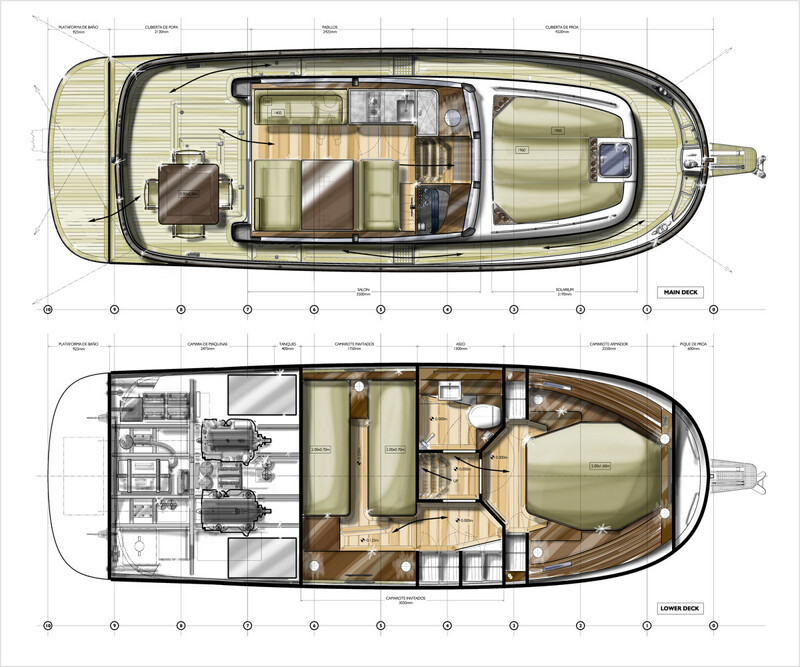 To cap it off, Sasga has drawings online for a sporty 68 fly. Though the proportions are different model to model, they all share a similar genetic makeup. Each sports a heavily flared bow on a rounded foredeck, a near-vertical stem and fine entry, and hard chines on a semi-displacement hull. The defining characteristic of the look is a double-ended stern, which some may not like on the smallest model, though I find that it gives the boat an endearing quality that is uncommon on most of today’s production yachts. On the larger boats, the effect of the double-ended stern is less noticeable and probably fits with the aesthetic better if you don’t find the 34 as cute as I do. 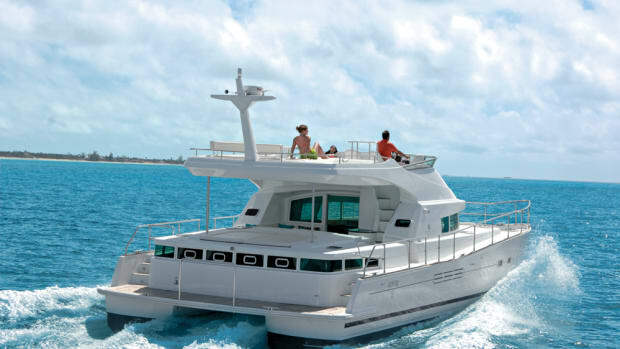 Showing the 34’s generous hardtop overhang, and the optional passarelle for Med-style boarding. Partially visible is the “hatch-within-a-hatch” design to access the engine room space. We met Paul Flannery and Rob Welling of SYS for a tour of the 34 during the 2017 TrawlerFest in Stuart, Florida. Stepping aboard, the first thing that strikes you is the generous room. This is a small cruiser that still somehow features walk-around side decks that are protected by bulwarks, and yet the sacrifice inside doesn’t seem like a bad trade-off. 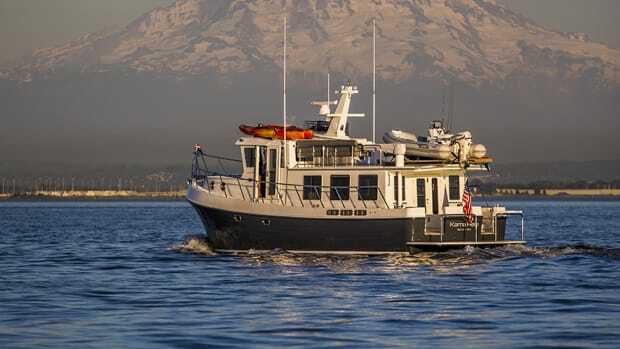 Due to her double-ended shape and lack of taper, the foredeck and afterdeck are spacious, giving plenty of room for a modest group of people. 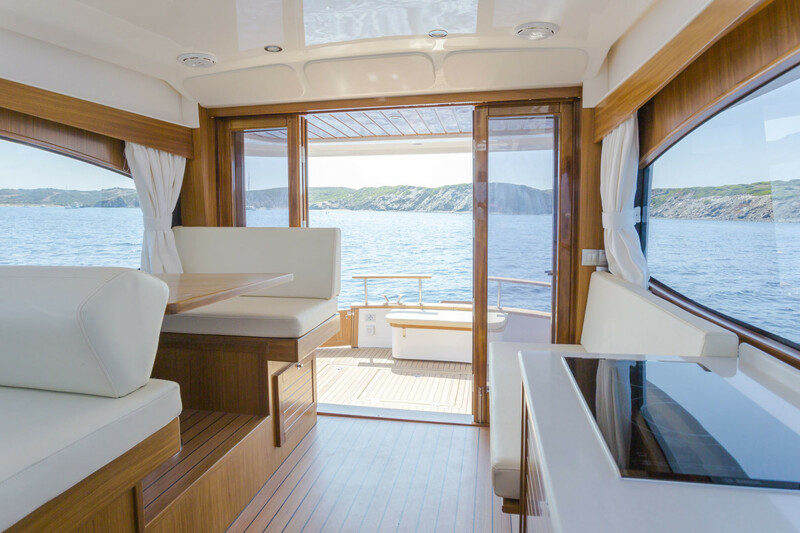 The semi-covered afterdeck sports a double-door entry to the saloon, where the doors accordion out of the way to create continuity throughout the main level, from helm to transom seating. This design increases the overall perception of onboard volume. Another interesting feature of the teak afterdeck is the hatch entry to the engine room. With a cleverly nested design, the engine room can be accessed by a large, gas-assisted hatch measuring 6’ x 4’. Once open, the owner can easily get to anything in the engine room for service on either one of the motors. For a quick look, though, there is another square hatch nested inside the larger one that can be used for the purpose of quick inspection of the space. Double-folding doors and a continuous level lead to a spacious feeling on board, even with walkaround side decks. Like many European designs, the interior is defined by elegant simplicity, with flat-faced cabinets and very little trim to speak of. The saloon, galley, and helm are on the same level as the afterdeck; the straight galley to port and the four-person saloon dining table to starboard, just abaft the helm. The backrest on the bench helm seat—much like you’d find on a Ranger or Cutwater—flips forward to complete the dining table four-top. Seats are ergonomically comfortable and headroom is plentiful at 6’ 4”. 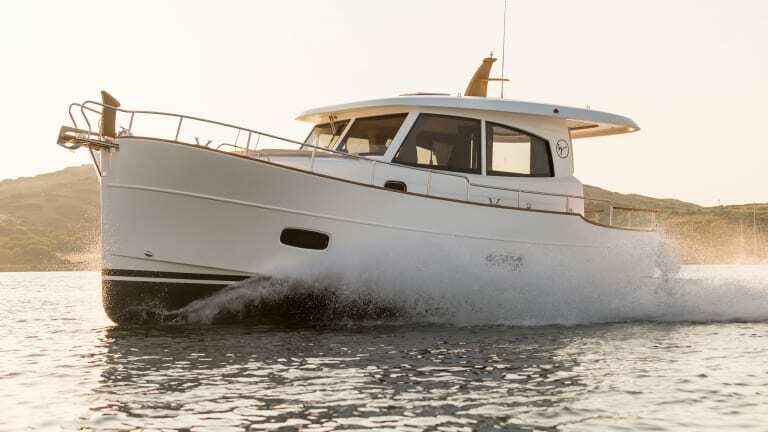 The helm is beautifully constructed and adorned by Sasga’s signature wheel, retro-look dials, and equipped with a Raymarine electronics package. My only qualm here is that a tall captain (exceeding 6 feet or so) may need to scrunch down for full visibility. This is better than the opposite problem as the fix would be simple enough. Otherwise visibility underway is clear and without issue. Belowdecks you’ll find a dual-twin-berth second stateroom that lives directly under the helm and galley, running transverse to the hull, and accessed just before the entrance to the forward, main cabin. Thanks to oval portlights on both sides, the cabin feels light and surprisingly spacious despite the necessarily compromised headroom. 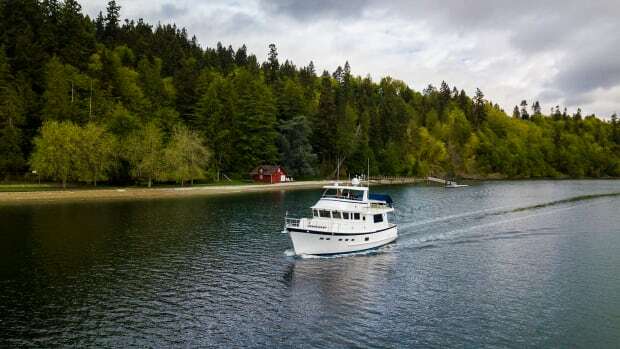 The forward cabin sports an island queen berth, and it, too, benefits from great natural light ingress through trunk cabin portlights as well as hull-side ones to port and starboard. Since she is built in Europe, all the stringent CE ratings apply for safety egress and security on board. 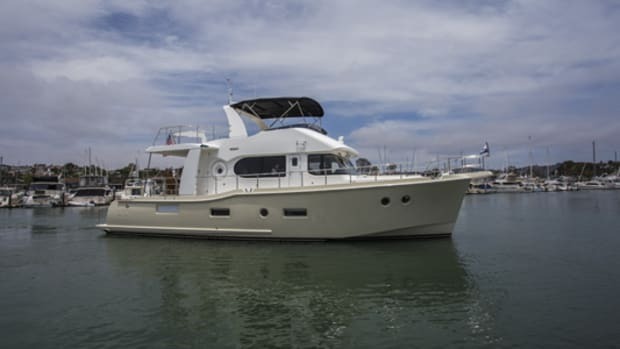 The Minorca 34 is an efficient operator at a range of speeds on her twin, 225-horse Yanmar engines. 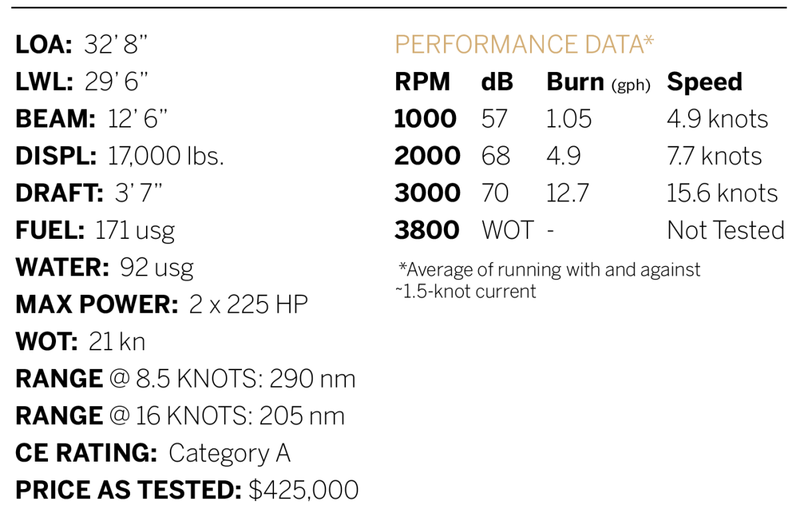 Running 2,000 rpm yielded a pleasant, slow cruise of about 7.75 knots. At this speed, total fuel burn was around five gallons per hour and cabin noise was predictably low at 68 decibels. Our top speed during testing was 16 knots, though that was not wide-open throttle. At 16, the engine rpm hit 3000, and surprisingly, sound levels only increased to 70 decibels with the after doors closed. 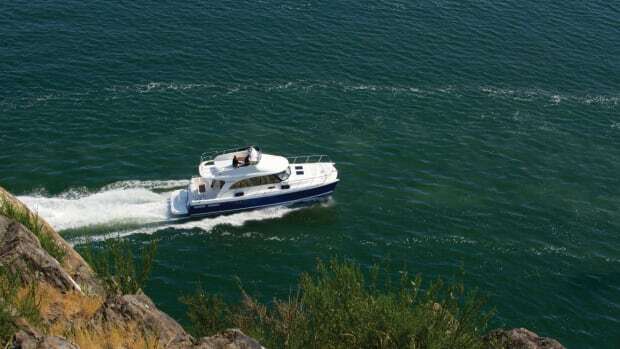 The manufacturer’s sea trials in open water point to a top speed of 21 knots, achieved by throttling up to 3800 rpm. At 16 knots, the fuel burn climbs to a still manageable 12.6 gph. At only 17,000 pounds of light displacement, the boat drives easily through the water. With her shallow draft of just over three feet, and fine entry into the water, she skimmed through the shallow water easily. The aft position of the engines is achieved by pairing a V-drive with a ZF transmission (as mentioned, the engines sit inside the lazerette behind the after bulkhead), keeping the noise well attenuated. The Minorca’s on-water performance and stability underway benefit from a skeg keel that runs far aft, giving the boat solid tracking at speed and confident maneuvering in tighter spaces. While the cabin got louder cruising with the doors open, opening the saloon to the afterdeck felt very natural underway.